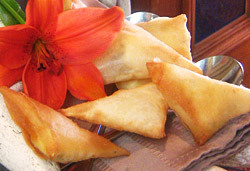 The easiest samoosas are the gorgonzola-filled option and they never fail to impress. I relish the warm centre of oozing gorgonzola surrounded by the crisp spring-roll pastry. Simplicity at its best! *Place your individual spring roll pastry vertically in front of you. Take the left hand bottom corner of the pastry and fold it, making it form a triangle that is touching the right hand side of the pastry. *Place the gorgonzola ball under this pastry flap and push this down securely making sure the corners are pointed and closed tightly so no cheese will later ooze out. *Where the triangle forms a line on the pastry (the top open flap of your triangle shape). Fold the pastry along this line and lift your triangle so the bottom point touches about ¾ its way up the right hand side of the pastry. *Then take the bottom right corner of the pastry and fold this tightly over to the left hand side keeping in mind you want a triangular shape. Allow each side to meet perfectly so all corners are tight so no later oozing on frying. *Place a thin brush of the slurry or flour paste at the top of your pastry and continue the same process of rolling up. Please post your comments and any food-related questions below.